Enrich the visual appearance of your pond with this non-toxic pond colorant. The shading also reduces sunlight penetration, thereby limiting bottom plant growth. It will NOT harm your fish, pets, or other wildlife. Water soluble packets provide easy application and comes in two color options: traditional blue and the newer dark blue. ​Apply in the spring when water flow has subsided. ​Generally once or twice a season. 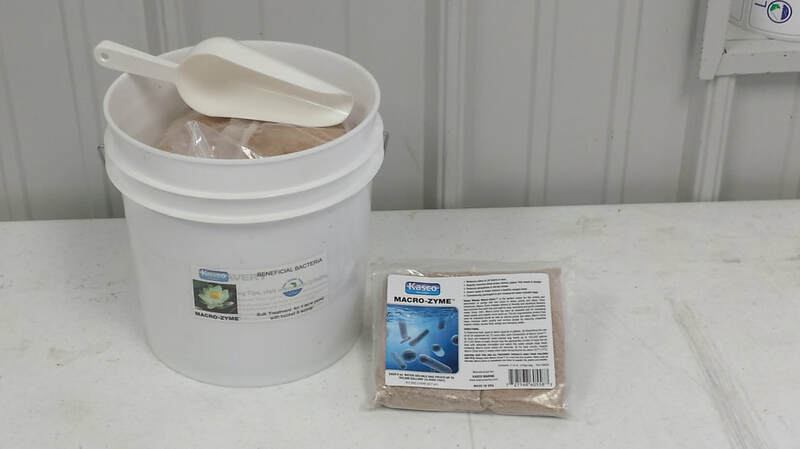 This non-toxic bacteria/enzyme product helps to decompose organic matter on the pond bottom from animal waste, grass clippings, fallen leaves, and fertilizer runoff. This process helps to reduce the nutrients available for algae growth without the use of chemicals and increases available oxygen levels as well as improves water clarity. Apply when the water temp. has reached 55 °. ​ Can be added monthly, 3x during the warmer months. The application of barley straw has received attention as a way to clarify ponds. Research with the decomposition of barley straw bales show that it aids in balancing water quality. As it degrades, peroxide is created, which deters further algae growth. Barley straw pellets are natural, easy & clean to apply, and break down quickly. ​Apply at anytime, generally once a season. Click here to read more about algae issues from the Kasco Aqua Advisor Blog. Pond Clarifier is a natural alum product that ties up small particles in murky waters including phosphorus, a necessary nutrient for algae production and suspended soil particles. The small flecks are clumped together allowing them to settle from the water column, resulting in a clearer pond. Fish Haven Farm sells a high protein-based food formulated by Zeigler Bros. of Pennsylvania that is delivered directly from the factory ensuring freshness. This floating food is available in two pellet sizes. 10 lb food, bucket & scoop $15 Koi food is also available. This patented fish attractor provides the structure that fish seek out to hide from predators. Game fish are then lured to the area. Use these in clusters of 3 for optimal results. Two types of kits are offered. The Bass Ackwards ™ was developed at the fish farm based on fish feeding studies. The lure was released to the market in 1989. It has been nationally recognized and recommended by the North American Fishing Club and proven to catch most North American fish species. Away with Geese keeps geese on the move by disrupting their sleep patterns. Solar powered batteries provide nightly action. These lights protect a 75 yard radius and come in a shore mounted or floating water versions. A fluorescent light attracts bugs while a high speed fan disables and knocks them into the water. Mount the light on a dock or post that overhangs the water. Operates on standard 115V circuit. The 200 lb capacity hopper has a metal powder coated tripod leg design. The programmable digital timer schedules feedings up to 6 times per day in 1-20 second dispense times, casting up to 20 feet. It includes a 6-volt battery and solar panel charger. 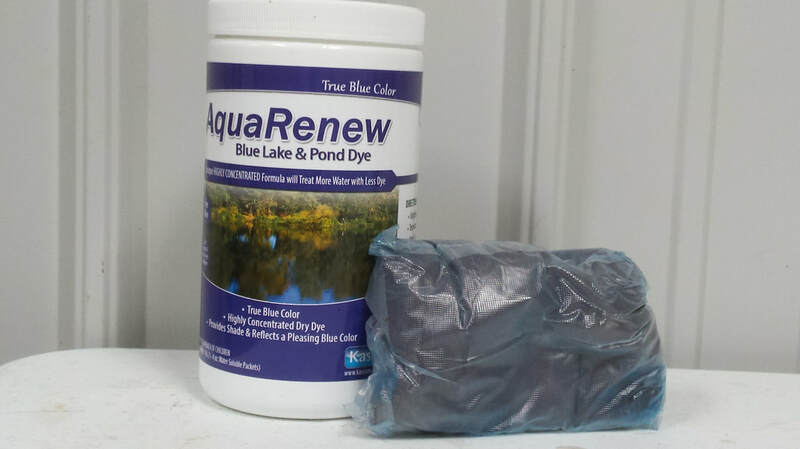 Liquid dye safely turns your ornamental pond blue, blocking out specific light rays limiting algae growth. Special added enzymes help digest organic waste and aid in creating a healthy environment for aquatic life. This non-toxic bacteria/enzyme product helps to decompose organic matter on the pond bottom to reduce the nutrients available for algae growth. Without chemicals, oxygen levels are increased and water clarity improved. Barley straw pellets are a natural alternative in deterring algae growth and clarifying ponds. The pellets are easy and clean to apply. Decomposition occurs quickly so the helpful by-products are released immediately. Zeigler Koi Grower is a high performance diet designed to meet the needs of growing fish during the earliest stages of development. Zeigler Koi Fancier is formulated to enhance the colors of your fish, improve immune function and promote healthy tissue development. The Robust-Aire Bantam system, made for outdoor use, is quiet, cost-effective and dependable. They are proven to provide optimized oxygen levels. These portable units are available with different flow rates and single or multiple diffusers, offering effective aeration for ornamental ponds up to 6 feet in depth.